The biggest obstacle that stands in the way of people going out and seeing the world is the cost of doing it. That cost is mainly attributed to flights. Domestic or international, flights can be quite expensive and finding a cheap ticket just sounds like hard work to most. While some work is required, it’s not that bad! What we didn’t discover until recently was how easy it is to find cheap flights, as long as you’re a little flexible with your timing and plans. We’ve found that the best way to find cheap flights is to utilize all the available resources at once. 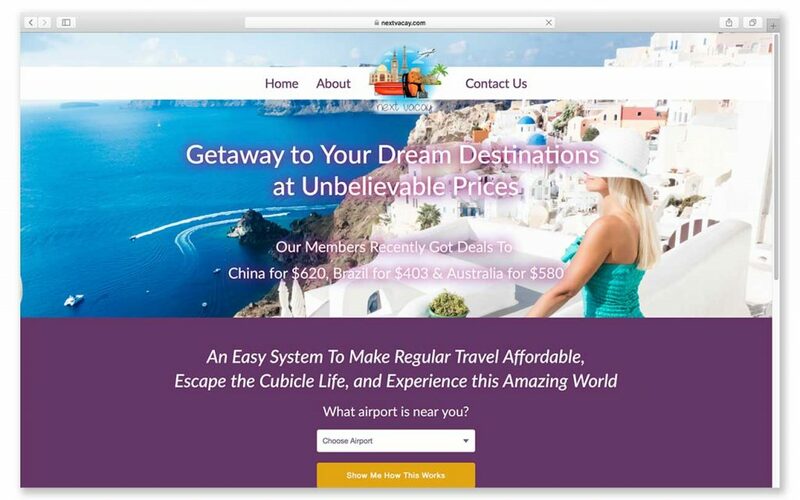 Google Flights, Skyscanner and cheap flights email subscriptions like Scott’s Cheap Flights or Next Vacay are there to help you! Bookmark these sites on your favorites tab and get those travel plans going! How do you find cheap flights on a search engine? Google makes it incredibly easy and there are multiple ways to search. Let’s say you want to get from Houston to Paris but don’t have a time frame for when you’d like to go. Just input your cities in the departure and destination fields and click on the calendar to start browsing through the dates. The great thing about Google Flights’ calendar is that it shows you the price of the cheapest flight under each date. 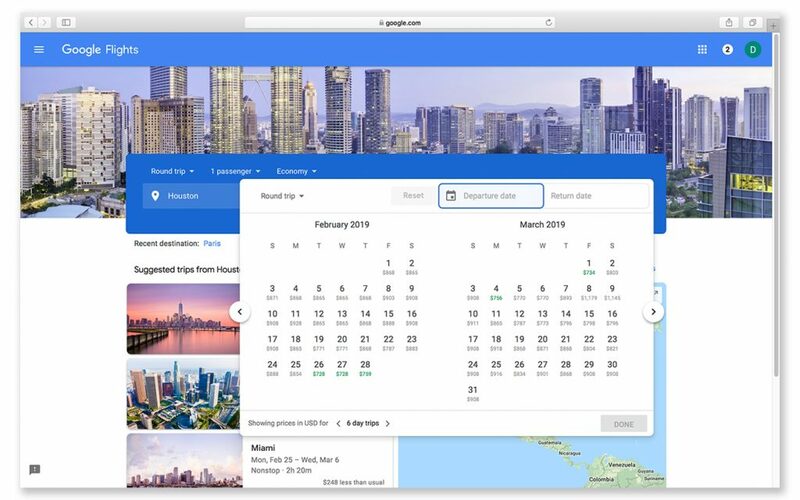 Whether you have a date in mind or not, using Google Flights’ calendar is an easy way to start planning and saving! Ok, remember we mentioned being flexible earlier? This is when being flexible is key. You might find a really cheap flight to Europe in the middle of February. That’s great! It’s off-season so it’s even cheaper. But the flight is 24 hours long thanks to a layover in Boston. Yikes! If that long flight is too stressful for you then keep looking! Odds are there are other reasonably priced flights (and a little shorter flight time) for that date or dates nearby. What if you know you want to be in Asia in March but you don’t care where? Well, the great thing about Google Flights is you can search ALL of Asia as your destination. 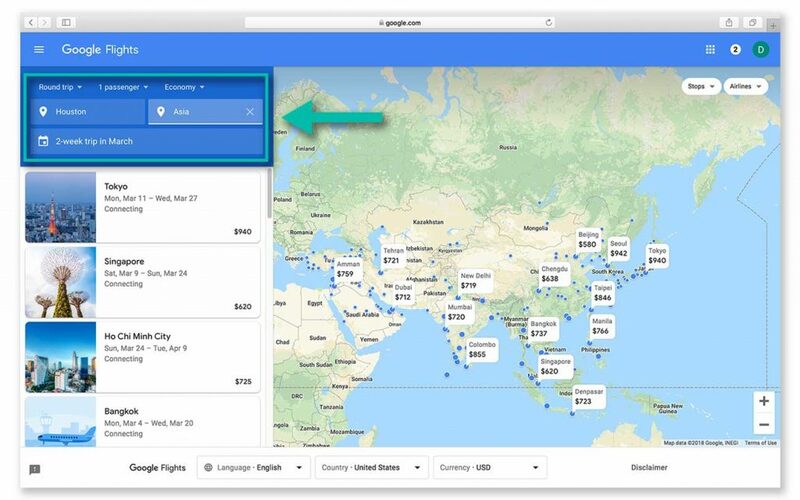 Google will pull up a handy dandy map that shows you the price of flights in major cities across Asia. Don’t see the city you want? Zoom in and it will start showing other airports, not just the major hubs. If you don’t care when or where then just input your departure city and click the “Explore Destinations” link to find cheap flights to various cities on the cheapest dates. Google Flights is how we get around and it’s our best travel buddy. 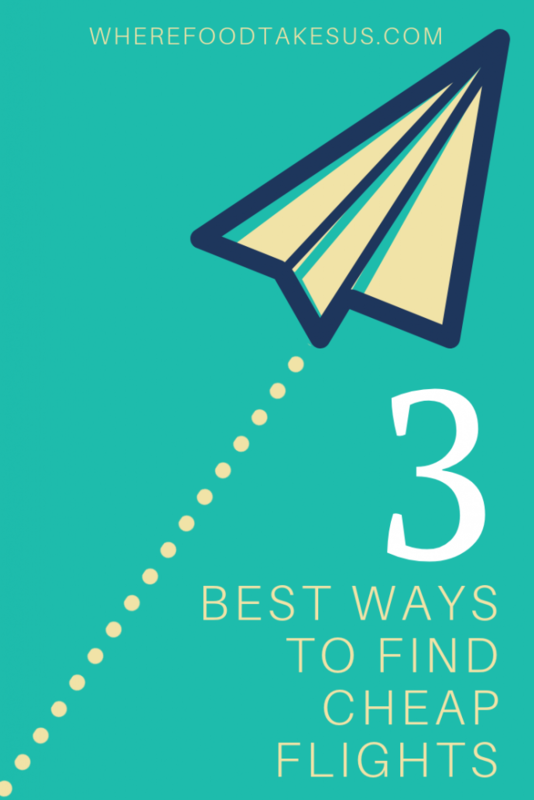 There are so many convenient and easy ways to find flights. We’re always thinking “Where to next?” and Google Flights lets us easily explore all destinations and prices in a few clicks. 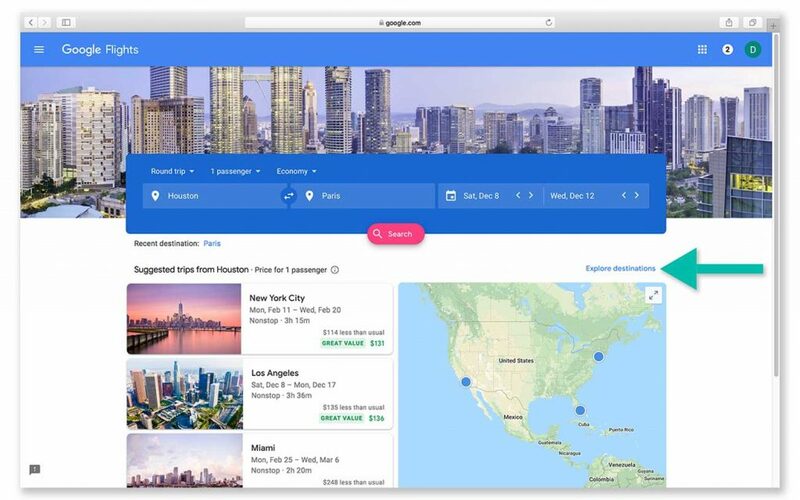 This site is great because it gives you a lot of resources for finding cheap flights. Darah used it constantly while she studied abroad in Italy back in 2015. A great feature of this website is you can search for flights to a destination by the cheapest month. You just input your departure and destination and choose “whole month” and click the “cheapest month” button when choosing your date. Boom. It’ll pull up all of the available flights. If you know you definitely want to go to Paris in June then be sure to select June and you can find the cheapest dates within that month. That easy! 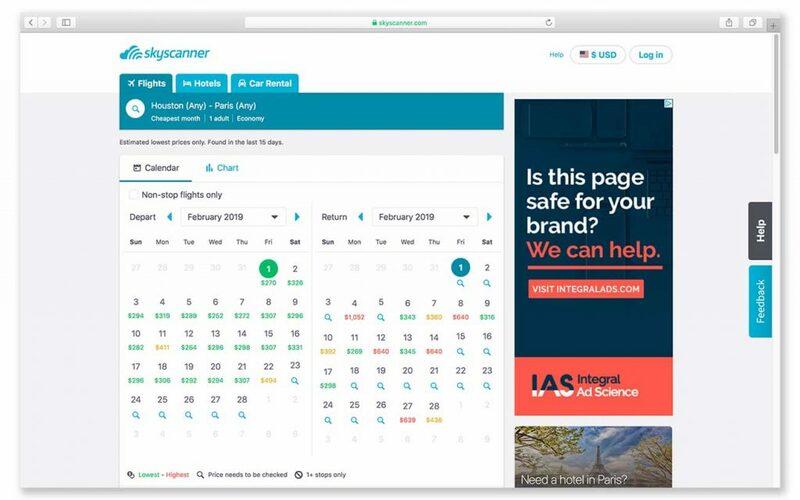 Like Google Flights, Skyscanner will search for the cheapest flights anywhere if you’re not set on a certain destination. If that’s the case AND you don’t know when you want to go then you can also search by the cheapest month. Keep in mind, sometimes when you search by the cheapest month it’ll pull up dates for the next month, which might be too soon for your trip. For instance, if it’s February and you search by the cheapest month, you might be seeing flight deals for March, AKA last minute deals. In most scenarios, that’s probably too soon for most travelers who are trying to plan in far advance. While Skyscanner is a great tool, it doesn’t always show you the cheapest flights. 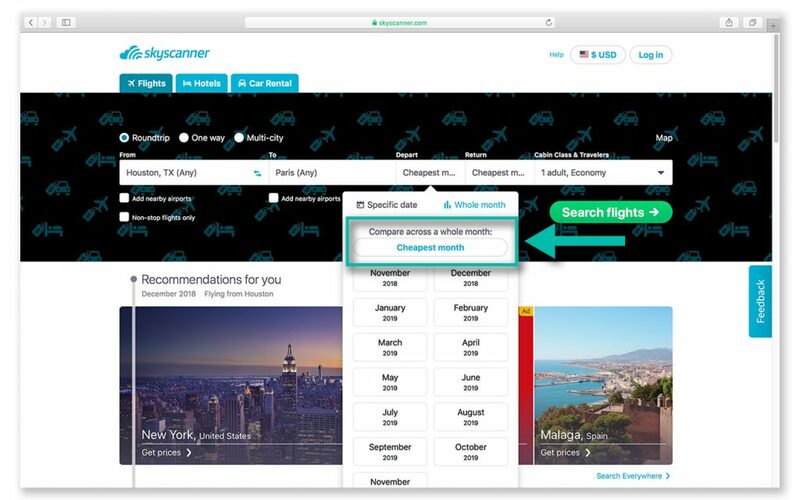 There have been times when we searched on Skyscanner where the cheapest flight (showing on Google Flights) wasn’t showing. It’s important to search across a couple different platforms so that you can be sure to find the cheapest deal. You know you want to travel abroad but you’re not sure when or you’re not sure where. Or both! Well, then we recommend subscribing to Scott’s Cheap Flights or Next Vacay. Both are great email subscriptions that do the searching for you. We only have experience with Scott’s Cheap Flights (2 years) but Next Vacay is very similar. 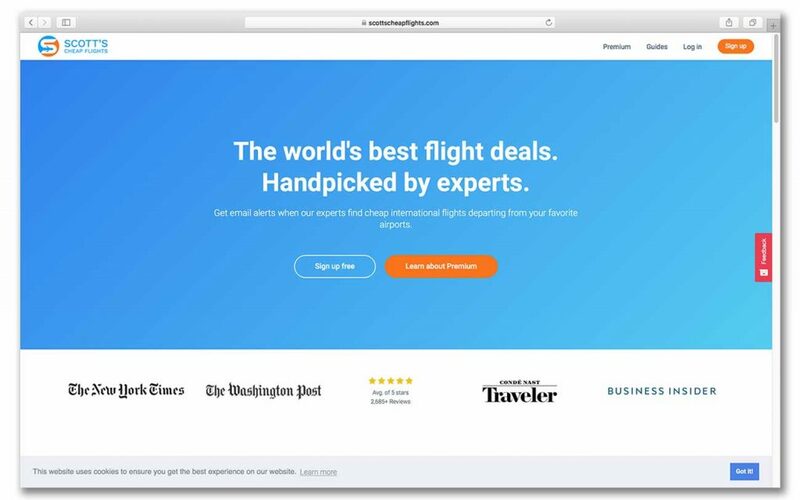 With Scott’s Cheap Flights you have the option of signing up for their free email subscription, which sends you occasional emails whenever they find a great deal, but you don’t receive all the deals. With the free subscription, you can choose what region to fly out of but you can’t choose specific cities. When they do send out an email, it’ll be 30+ minutes after the deals have been published. If you choose to spend $39 a year (which is what we do) then you can choose exactly what cities you want to receive alerts from as well as alerts for cities all over the US. 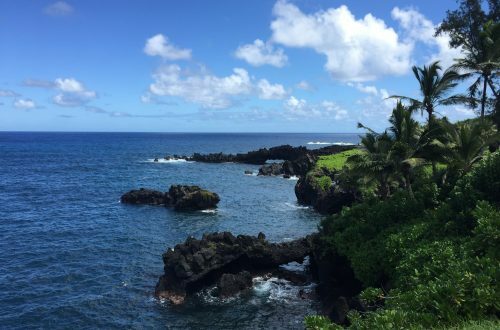 You can even receive emails about deals to Alaska and Hawaii (paradise!) or the ever rare “mistake fares”, which are dirt cheap flights that were accidentally published by the airline and are likely to disappear quickly. We advise caution with mistake fares as sometimes the airline does not honor your purchase price. Every situation is different! 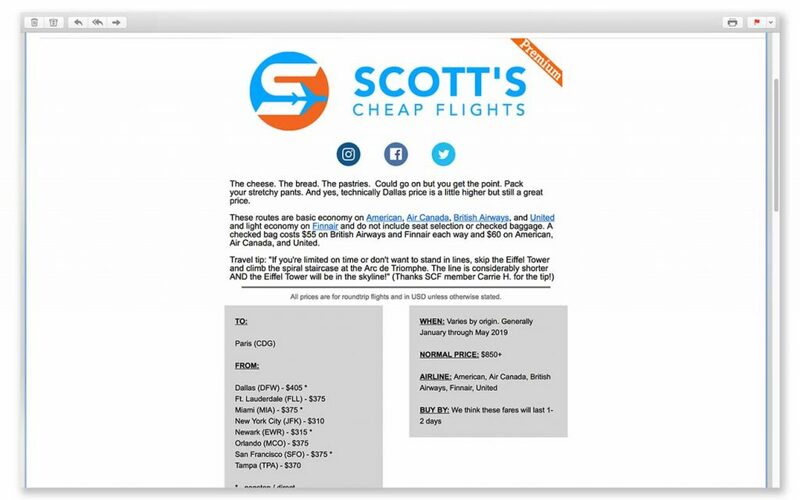 Scott’s Cheap Flights also allows you to log into your account to see all active deals all in one place. Pretty nifty! You can also view expired deals. Who cares? Well, you can get an idea of what deals have happened before. History does tend to repeat itself! Another great perk to the subscription is that you can receive deals about peak seasons. So, if you want to see the tulips in Amsterdam in the spring then you’re able to see those deals if they ever come up. Scott’s Cheap Flights is more than worth it in our opinion and we recently discovered that they find flight deals out of every continent now! Except for Antarctica. Of course, we can’t say yes to every email deal we receive, although we want to! Even so, our eyes light up and our brains start ticking to that travel beat whenever we see a deal. Who knows, maybe you’ll be ready to jump on that flight deal and be looking at an awesome trip in your future. We hope so! 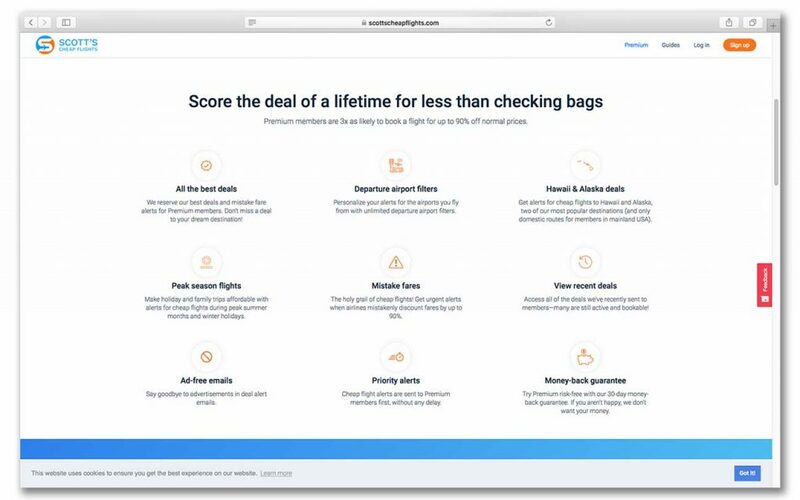 In comparison to Scott’s Cheap Flights, Next Vacay is $25/year and according to their website you’ll receive deals out of the airport that you select. We’ve also found you don’t receive as many deals as Scott’s Cheap Flights, but they still find all the high quality deals! If you’re on the fence about Scott’s Cheap Flights or Next Vacay, as always, do your research! As we’ve mentioned, flights are the biggest hurdle to jump when planning a trip. They usually come with that ugly price tag that can quiet your wanderlust. But using these flight tools, having a little flexibility, and being proactive will ensure that you find a great deal for your next destination. And who says you can’t just look at flights for fun? We’ve definitely just browsed Google Flights for fun to pass some time and then were inspired to travel. It’s all part of the adventure! Start looking now and tell us how it goes in the comments below! Good luck and happy travels!